Next Sunday, July 29, the past, present, and future will intersect (again) at Palo Alto’s Rinconada Library. Originally the city’s Main Library, the building first opened in 1958, as designed by renown Modernist architect Edward Durell Stone, employing his signature blend of clean, open spaces, strong indoor-outdoor connections, and patterned ornamentation. Group 4 had the privilege of working to preserve and expand this iconic building, infusing new library spaces, services, and architectural vocabulary that celebrate and complement the original design. The renovated (and renamed) Rinconada Library opened in 2015. On July 29, both projects will be co-presented by city library associate and Stone scholar Robert Skolmen and our own Jonathan Hartman, as part of the building’s 60th anniversary. Join us! The presentation will be at 2PM, Sunday, July 29, 2018 at 1213 Newell Road, Palo Alto. Also check out a photographic exhibit of Edward Durell Stone projects, and, of course, his gorgeous library! 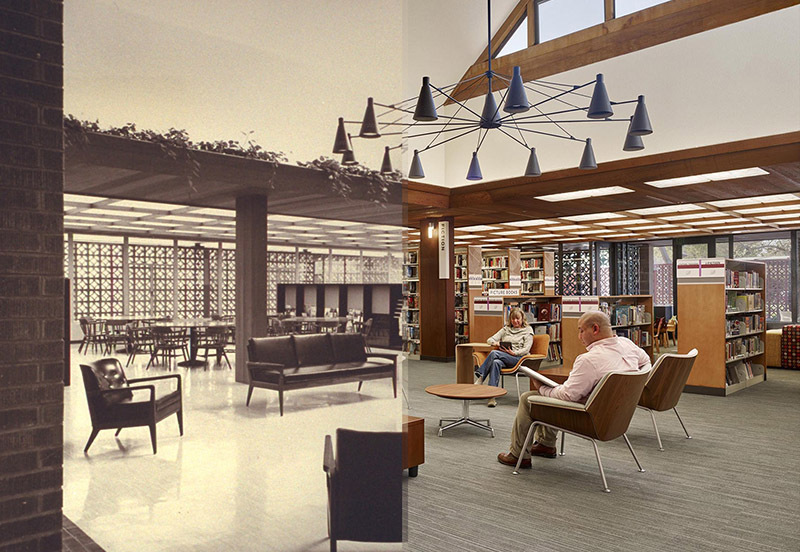 More on the library’s design and Sunday’s event is covered by Palo Alto Online.